Infographic: How Much Online Support Does Girl Guides of Canada Have? You’re going to love this post! 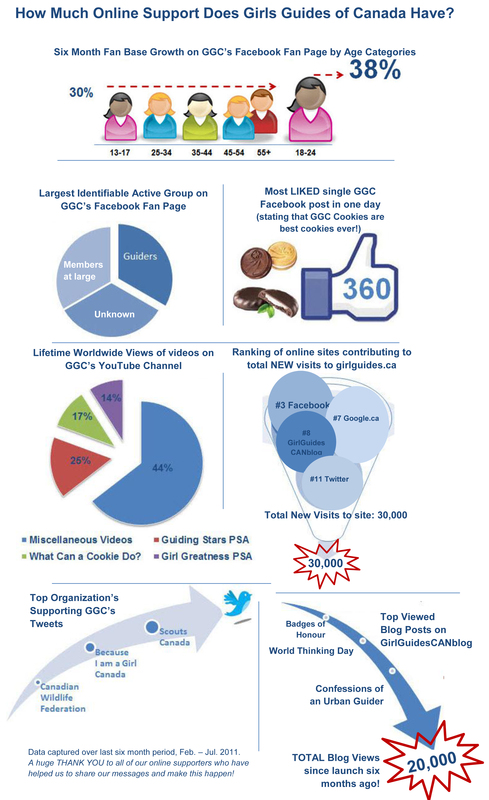 Not only is it GGC’s first ‘infographic‘, it celebrates the amazing support Girl Guides of Canada -Guides du Canada has had online over the last six months. Who knew?! Badges of Honour by Kelly Waterhouse. Confessions of an Urban Guider by Guider Tammy Sutherland, 3rd Saskatoon Rangers. This entry was posted in Uncategorized and tagged facebook, twitter, youtube. Bookmark the permalink. 2 Responses to Infographic: How Much Online Support Does Girl Guides of Canada Have? Thank you Linda! It’s always great to hear from a Legislative Member about the work we do!